When it comes to horse ownership we can sometimes overlook those who take a giant leap financially and emotionally to send a horse down the path to potential success. As with any sport, there’s only a select few who make it to the top and continue to stay there. Of course every horse is special, but when our passion for finding that fabulous horse results in national recognition, the rewards are that much sweeter. Now tasting the sweetness of success with their first year horse, Small Affair, owners Liz Reilly and Chris Iwasaki are riding high. Small Affair and John French made a strong statement at Indoors this season, earning the Reserve Championship honors at both Harrisburg and Washington. The collective team also won two prestigious World Champion Hunter Rider Awards at Capital Challenge – the Jeffry Katz Award and the Rox Dene Award. 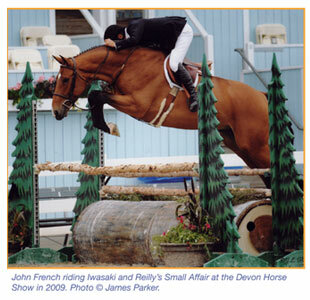 The first is actually awarded to the rider of the WCHR high score horse who, in this case, was the phenomenal John French. And the second award, established in the name of the famous hunter Rox Dene, is awarded annually to the owners of the WCHR high score horse. Although not listed in the awards, trainer Scott Wilson also deserves credit for helping Liz and Chris attain their goals this year. This is not the first time they have experienced the thrill of victory, as Small Town continues to win under the tutelage of Keri Kampsen and Joe Thorpe of Sovereign Place, first with Nicoletta Von Heidegger and now with her younger sister, Hannah, in the irons. And the newest hunter on the field, who’s been holding her own quite well in the pre-green division, is Small Collection. Some of us know Liz and Chris from their hard work in the industry. For many years both have made a living in parts of the horse world that go unnoticed. Liz manages the books of a number of west coast professionals and Chris manages Scott Wilson Stables, with upwards of 20 horses on the road throughout the year. By means of his relationship with Liz, Chris now shares in the thrills and chills of horse ownership. We spoke with Liz about her passion for horses, which of course fuels the fire for both career and commitment to finding, buying and developing top hunters. EqSol: Naturally the first question: What is your horse history? LR: I started riding when I was 11 years old on Long Island and continued until I was 19. I was lucky to have a great mix of experiences from pony club, cubbing with the foxes, to horse showing. I loved the horses and basically lived at the barn. After going to college at Hollins College in Virginia for my freshman year, I then transferred to UCLA and never left California. EqSol: When did you start buying young prospects? LR: About twelve years ago. We’ve purchased maybe six to eight horses over the years. Ultimately, I try to buy horses that I will enjoy riding, owning and if they sell that is a bittersweet conclusion. EqSol: Talk about the pros and cons of being an owner. LR: The pros are easy – I love horses, love to ride and I truly enjoy the process. It is a childhood dream come true. The cons aren’t so easy to express. The responsibilities of owning can be challenging – to me it’s worth all the risk because I get to ride. This isn’t our livelihood, it’s a passion – some we’ve sold, some we’ve given away. We also get really attached to each horse, so it’s actually a bit difficult to lease or sell one and have it leave home. I adore Small Town. I feel so lucky that he got leased to Sovereign Place, as they have been absolutely wonderful with him. They have really allowed me to remain involved and be part of all his huge successes. EqSol: Tell us about the journey from prospect to champion with both Small Town and Small Affair. 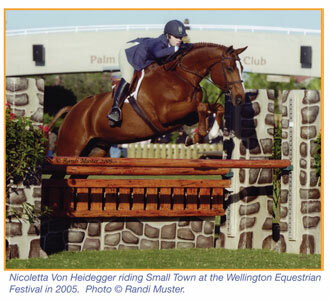 LR: Small Town – ‘Ollie’ – was my friend Abby Vietor’s horse. As soon as I saw him I loved him. I thought, ‘This is a horse that Scott Stewart would own.’ He had all the pieces – a gorgeous horse with the most beautiful gallop and a great jump. When Abby moved and couldn’t take Ollie to the east coast, I offered to help her sell him. When he didn’t sell as quickly as I’d hoped, I was able to get him through the help of Jim Hagman, who has always been a great supporter of all my equine endeavors. Very talented but very slow to mature, he was the kind of horse that if something spooky was going to happen – it would happen while he was in the ring, or at least he would notice it. He wouldn’t do anything scary – he was just spooky back then (I rode him when I was seven months pregnant and never worried). In his second pre-green year he started to win everything. The following year he got sick at Indio after winning in the First Years week one, but by spring he was winning again. I rode him in the adults that summer and took a break when I was pregnant with Augusta. Nicoletta leased him in 2005 and he has remained in Keri and Joe’s barn ever since. Small Affair – Mary Morrison (Ivy Gate Farm) imported ‘Poker’ from France where he was successful in the young jumper championships. I originally saw him when looking at horses with Jim but he was way too green for his client. Then Scott and I went to try him last year. His form over the first little jump was the best I’d ever seen. When we got in the car, Scott, who is usually mister talkative, wasn’t saying a word. Finally he said ‘If you don’t vet him I will have someone else in the barn vet him.’ In 2008 he did the pre-greens as a six year old with Alissa Smith and Keri Kampsen and only won a few ribbons here and there. He was young and all over the place. We asked both John French and Jenny Karazissis to show him this year in the first years. He was champion or reserve almost every time, and won a class at Devon. He’s won a class at every major show he’s competed in, and often wins the under saddle. Next year is his Hunter Derby year, plus I’m going to start showing him. Small Collection – ‘Daisy’ – is a pre-green horse, our latest purchase. Unlike when we found ‘Poker,’ we tried fifteen horses in Florida. She was the second to the last horse we sat on. I jumped one jump and said this is the horse. 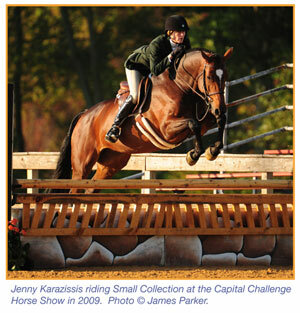 Jenny K showed her this year and has been champion or reserve several times. EqSol: You’ve been at the top of the hunter ranks many times in the past. How has it been with Small Affair? SW: I think he’s one of the most athletic horses I’ve ever worked with, possibly one the best hunters in the country and he also wins a top ribbon in the hack. It was clear on the first day I saw him that he was special. Liz has a good eye for horses – she knew. He was relatively easy to bring along and proved to be better over a bigger jump. He’s brave and should be a great derby horse. EqSol: How does it feel after Indoors is over? SW: It was a dream come true – a real Cinderella story. EqSol: How do you know that any particular horse is ‘the one’? LR: How do you know? Ollie had the ‘look’ and the talent. Poker has that incredible jump. I knew Daisy was the kind of horse that anyone could ride. After all I do want the luxury of the horses being for me. I have always felt confident sitting on all of these horses. Of course I know when to step back and let the horse be trained – I don’t ask for the horse to be an amateur horse out the door. Do I hope it becomes a great one? Sure. And yes it’s expensive. We manage to afford it through a lot of hard work and some trade, which saves us money. It’s rewarding to be successful, but in the end I really love the horses. Thank you Liz – congratulations on a great year and we wish you continued success.